Sledding with Mark Critch in Victoria Park ? Come out for the laugh! City outlaws crazy carpets and flying saucers. Click on image to enlarge to read all of the regulations. 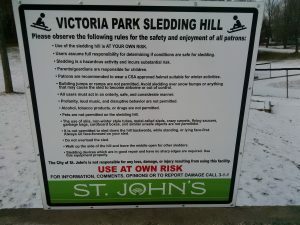 Signage declaring new regulations about sliding on the hills in St. John’s has been posted in public places throughout the city. The signage declares a whole raft of rules about what can and cannot be done when snow sledding. 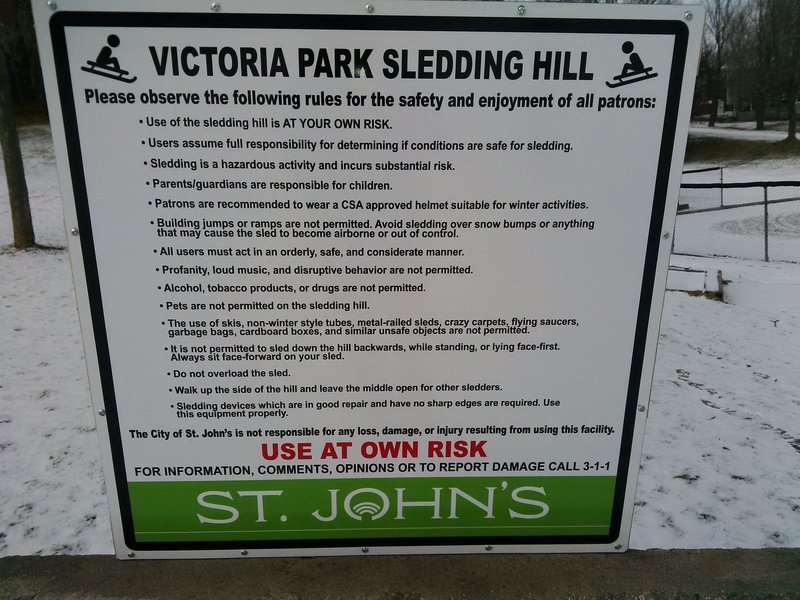 Some think that this is a new conversation, but the reality is that regulations about snow sliding or sledding in St. John’s started more than 100 years ago. There was a time when citizens of all ages loved nothing more than grabbing their sleigh for a ride down of the steep hills of the city. The practice was however quite dangerous. The local newspapers reported on an almost daily basis about individuals being injured on the hills of the town. Please join the board of the Victoria Park Foundation on February 9, 2019 from 4pm -6pm with our honorary Chair Mark Critch for an early evening of sledding in this historic park. Learn more about the revitalization of the Park that began in the Fall of 2016. 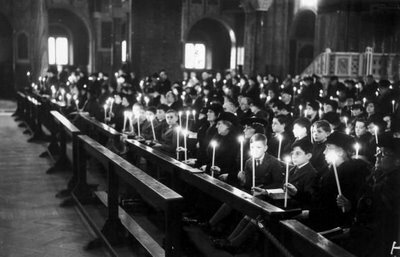 Phase 1 included a number of improvements including and the illumination of the Sliding Hill. There is during the sledding event the promise of hot chocolate for all and prizes for some activities that are planned. This entry was posted in Archival Moments and tagged sausers, sliding, snow, St. John's, winter on January 29, 2019 by Larry Dohey. When historians ponder the great pastimes of Newfoundland and Labrador’s largest city, things like rowing in the St. John’s Royal Regatta or hiking Signal Hill come to mind. But Larry Dohey, Director of Programming and Public Engagement at The Rooms has come across another historic part of our heritage — grumbling about the city’s wintry weathe. This entry was posted in Archival Moments and tagged sleigh, snow, weather, winter on January 17, 2019 by Larry Dohey.